Dust storms are associated with Cumulonimbus clouds and are accompanied by sudden changes in temperatures and humidity levels. They often have a clearly defined forward edge. One can sometimes see a vertical motion of dust inside the storm. During dust storms, wind speeds vary from 11 to 40 knot with visibility reducing to less than 200 meters. A squall is referred to a sudden and rapid increase of wind speed by at least 3 stages on the Beaufort scale and lasting up to at least one minute. The wind speed can vary enormously and may exceed 22 knots (40 kmph) or more. A squally weather is generally associated with convective clouds, depressions, cyclones or strong weather systems. When frequent squalls persist over long periods, we call it a squally weather. A thunderstorm is also known as an electrical storm or a lightning storm. This type of storm is characterized by the presence of lightning and thundery activity. Basically, a lightning’s acoustic effect on the Earth's atmosphere is known as thunder. We should keep in mind that not all thunderstorms bring rain. 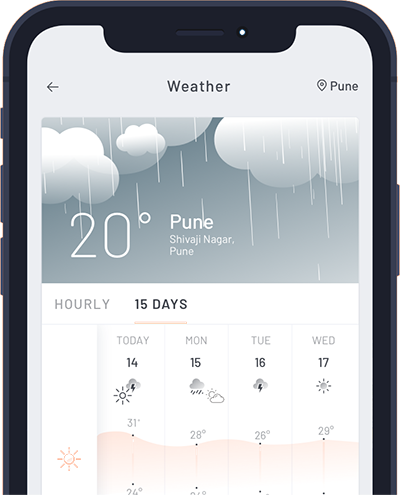 Almost continuous pearls of thunder and frequent flashes of lightning, with maximum wind speed exceeding 15 knots, bring moderate to heavy showers. This weather phenomenon is known as thundershowers. Thundershowers are basically preceded by thunderstorm activities. Cloudy & sunshine atmosphere in arvi , withtemp . 43 Degree , isthre is rain in arvi .